REB Talks - Can We Talk About Israel? Maybe Not. Support for Israel is in our Jewish DNA. Yet, defining "support for Israel" isn't as simple as it sounds. Does it mean: she can do no wrong? Can we criticize her? Are we self-hating Jews if we disapprove of her? Come hear how professionals deal with these questions. We will then discuss our own feelings about these questions as well as discuss last week's congressional vote on hatred. Be a part of this bi-monthly discussion on topics that are worth sharing with others. All are welcome to attend and all are encouraged to listen, learn and grow. All are invited to study the Bible with Rabbi Robbie. Bagels and coffee are provided for all wishing to explore how the Bible is a mirror of our lives. No previous knowledge is required and all backgrounds are welcome. On this morning, we will continue our discussion about the mysterious prophet Elijah. Come be a part of something meaningful!!! When do I sit? Why do we bow at certain times? What is the meaning of the Kaddish, anyway? We all probably have these types of questions before we enter Friday evening services and the questions keep coming as the evening progresses. Well, Shabbat 101 is here. Rabbi Robbie will be conducting the second of two learning Shabbat services to help us understand the prayers, their deeper meanings and the powerful nuances within their poetry. By the end of the session, we hope you will feel more comfortable during Shabbat services. 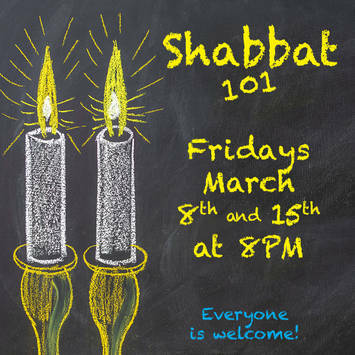 Join us for this spiritual and educational Shabbat experience. TBA members are welcome to come and see two movies from Jacob Burns Jewish Movie Festival on April 3rd at 1pm. Special pricing of $ 9 per person includes two movies plus refreshments and introduction to the movie Kitty & Ellen by filmmaker Leah Galante. Your payment is your reservation. We have extended our RSVP date to March 18th. Please send in your check today - $9 per person, payable to Sandy Breitbart. Mail to: Sandy Breitbart 3478 Munson Place Yorktown Heights NY 10598. We will meet in the Jacob Burns Film Center lobby at 12:30pm, for the 1pm movie. Questions: email Karen Stachowicz, golfskibum22@verizon.net.